Food delivery giant Zomato is facing a tough time as controversies are deteriorating the brand image. Days after a deliveryman was involved in eating customer’s food case, the company is now facing problems as a family has found plastic fibre in an order in which hey ordered Paneer dishes. “I ordered paneer chilly, paneer masala, etc for my children. When we started eating, my daughter told me the paneer was very hard and her teeth hurt while chewing it. When I tasted it, I found fibre,” said Sachin Jamdare, the customer. “I was really worried about my children’s health. I went to the restaurant to speak with the owner. 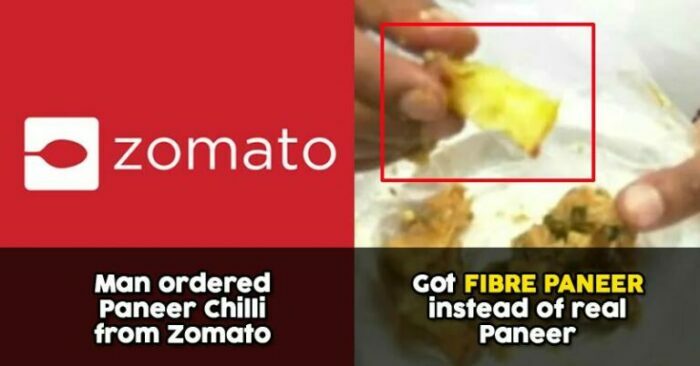 They did not entertain my issue, saying that maybe Zomato guy did something. I went to the police station and lodged a complaint. I wanted to raise awareness among our countrymen how these people can play with our health for something as little as Rs150,” he added. Mean Zomato apologized for the incident saying that the restaurant has been suspended from their platform. Zomato should be very careful while adding restaurants in its network otherwise such incidents will keep on happening. What do you think about the incident? Let us know your views.